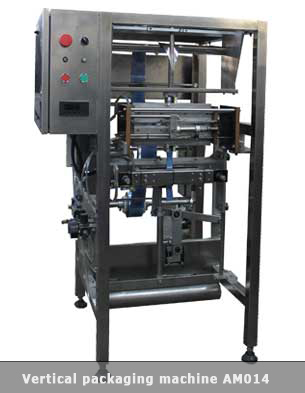 The vertical packaging machine AM014 is used for the forming, filling and sealing of plastic bags. More information related to the working method and overall characteristics of the vertical packaging machine could be found here. Depending on the size of the stick package, the machine can be equipped with more than one channel. Bag length adjustment via photo cell or encoder. 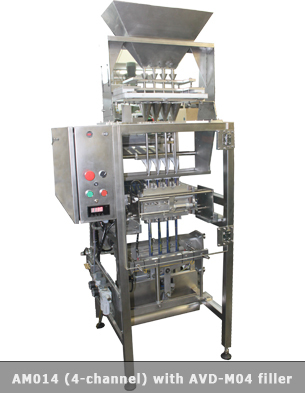 Appropriate for the dosing of liquid and semi-liquid products like ketchup, mayonnaise, mustard, sauces, shampoos, etc. 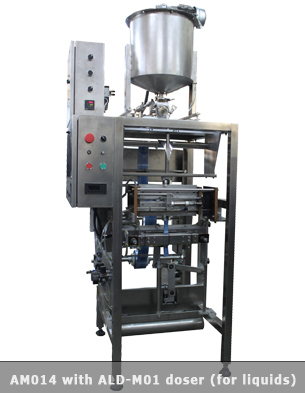 Video 1: Vertical packaging machine AM014, equipped with an auger filler ASD-02 series M (for coffee, supplements, proteins, cacao and others). 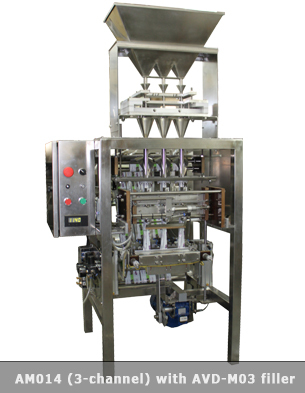 Video 3: Vertical packaging machine AM014, equipped with a dosing device for liquids ALD-01 M series (for honey, ketchup, jam, etc...).